Car detailing doesn't require professionals, so costs will determine if it's worth your time. Use this breakdown of pro car detailing prices to decide. Car detailing prices vary depending upon a number of things. Vehicle size is a major determinant, as is the type of package you select. Basic packages for smaller vehicles are generally less expensive, and additional costs may be added for upgraded services. You may also seek discounts or coupons for such things as pre-payment of services, multi-car detailing, long-term contracts or long-time customer status. Many services can be included in car detailing and you may have several options and packages from which to choose. Variance in price will be largely based on the detail, professionalism and reputation of the business. You should expect to pay more for high quality service. Basic car detailing service should include a wash, wax, interior vacuuming, interior polish, window wash, mirror and trim cleaning and tire cleaning. You can expect to pay $50 to $125 for an average sized vehicle and $75 to $150 for an SUV or van. An upgraded package usually consists of much more attention to detail. These details will vary by location so be sure to inquire about exactly what services you'll be getting for your money. Upgrades generally cost $150 and up for regular sized vehicles and $175 and up for larger trucks and vans. Additional services may include things like the use of a higher quality cleaning product, special equipment or extraordinary care for vintage cars, boats, motorcycles or RVs. A superior wax is generally $50 and up. 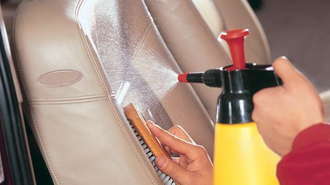 Steam cleaning of the interior or carpet shampoo could cost $75 or more and cleaning of leather upholstery averages around $50. You may also find services for dent removal, engine cleaning or wheel detailing at some car detailing shops. Read on to learn how to save money off of the process of washing, waxing and polishing your car. If you decide to do your own car detailing at home, you'll save money by looking for car products discounted from their regularly priced levels. Discount car wax, cleaning solutions, chrome polisher and a variety of other tools and materials you need to detail your car are available, but they do require some searching on your part. Look online for discount retail stores that specialize in these materials. You may also wish to contact local auto body shops to learn about where they get their supplies. Finally, many car body equipment stores offer seasonal sales and rebate offers. Keep an eye on your local paper and online for sales listings, and stock up on materials when they have been marked down. Many of the cleaning solutions and other materials you purchase to detail your vehicle can be used sparingly and for multiple projects, provided you know what you're doing. Read the instructions carefully on any cleaning solution before you apply it directly to your car. Many of these solutions require you dilute them with water. This serves to not only weaken the solution so it won't damage some component of your vehicle, but also means you'll be able to make the solution itself last longer, saving you money. The same applies for car wax, chrome polish and other materials as well. The less frequently you detail your vehicle, the more intensive the project is and the more likely it will cost you a good amount of money. In order to keep your costs down, it helps to detail the vehicle more regularly. Try to give your car a full detailing job every three months or so. This way, none of your materials will expire or go bad in the meantime, and the amount of cleaning you need to do in between detailings will be minimized. It also helps keep your car looking its best.